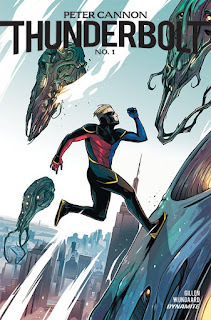 I am a big fan of Kieron Gillen. He is a writer capable of great variation and unlike some writers who I adore but seem to stick to certain themes, ideas, or character archetypes, Gillen just is all over the place--in a great way. Gillen can write a comic book about a world where music is magical ("Phonogram,") give us a yarn about supernatural God ("The Wicked and the Divine,") or present an alternate universe World War II where the Nazi's developed superhuman ("Uber"). Therefore, hearing that Kieron Gillen is going to be writing a new, "Peter Cannon: Thunderbolt," comic for Dynamite makes me intrigued by how it sounds potentially fun. I of course am probably the one person who remembers and really liked the, "Peter Cannon: Thunderbolt," comic from 2012, when Dynamite last had a book with the character (I believe there haven't been any others). One interesting thing about Peter Cannon is that he was of course one of the original Chalrton characters that Alan Moore based Ozymandias upon for his world-renowned comic, "Watchmen." Unlike some former Charlton heroes DC Comics has the current rights to however (The Question, Blue Beetle), Peter Cannon is an IP currently owned by Dynamite. That doesn't neccesarily have any bearing on the kind of comic Gillen will be making, but I wouldn't be surprised if a little bit of a Ozymandias-vibe ironically influences the character he was based upon. I suppose in January of 2019 we will know just what kind of Gillen-comic we are in for.